Cabinetry is among the most important design elements when updating or remodeling a kitchen. These are the pieces that dictate how the kitchen is laid out and, ultimately how well the space functions. Oak is one of the most prevalent cabinet wood materials on the market and is such because it is a durable material that accepts stain and paint well, meaning its looks are easy to change. Espresso brown is an excellent choice for modern styles and will cover oak well. Oak kitchen cabinets work equally well with a natural finish or the paint color of your choice. When you're looking to paint existing cabinets, preparation is the key to achieving a clean, even color and arriving at the desired look. Preparation is especially important for cabinets that have been previously painted or stained, as these conditions will make it difficult for paint to stick and the underlying color tends to create a finished look that is different from what you expected. Clean cabinet surfaces thoroughly and sand away existing layers of paint or stain. This will help the new paint stick properly and create the slightly rough texture that is ideal for achieving a good coat of paint. Use an electric sander for best results, with 220-grit sandpaper to remove any existing layers of paint or stain. Once you're finished sanding, vacuum up any leftover dust and debris completely before applying any paint. Lead-based paint is an issue for cabinets built and painted prior to 1978. If you are preparing to paint cabinets that are this old, avoid sanding completely. Instead, apply a de-waxed shellac as preparation for the new paint. In either case, a priming coat is next, and will provide a clean, neutral base that's ideal for bringing out the proper color and undertones in the espresso brown top coat. A number of paint types will work for kitchen cabinets. Latex paint is one of the best since it will resist stains, scratches and damage done by moisture. It is also easier to apply and clean up than oil-based paints. Use a roller to apply either latex or oil-based paint to prevent brush marks and other imperfections. 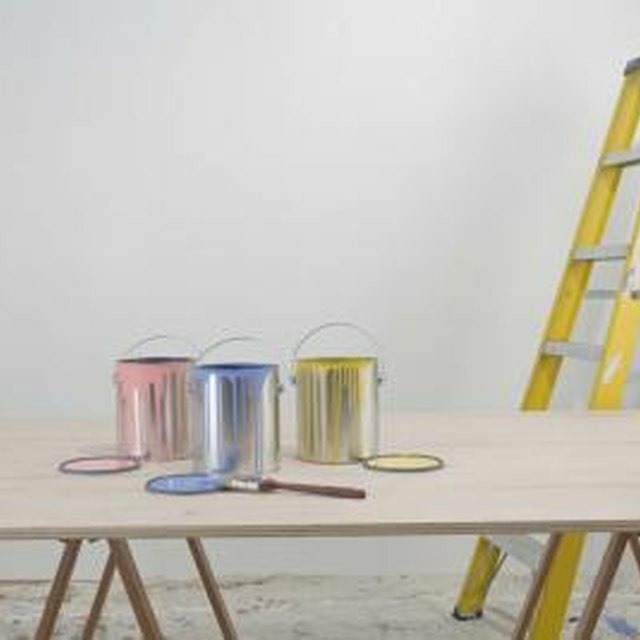 Spray paint is an additional option, and most major manufacturers produce a formula that is specifically for furnishings or household pieces that are exposed to rough wear and tear. Spray-on paints are the easiest to apply, but require everything in the surrounding area not intended for paint be covered with plastic sheeting. After the primer coat and the espresso brown paint have dried, the final step is polyurethane. This is a clear product available from home improvement or hardware stores that rolls on clear and provides a layer of protection for the paint. Once dry, polyurethane will prevent scratches, peeling, staining and other damage to the paint, prolonging the life of the paint job and the cabinet. A paint roller is the best way to apply this coat to eliminate streaks and other unsightly blemishes. Boston Architectural College; The Color of Materials: Wood; Amy Linstrom, et al.